Get $20 Opti-Dollars + A FREE Smoothie! And a chance to win $200 in prizes! When you attend all 4 events + SAVE with event only pricing! 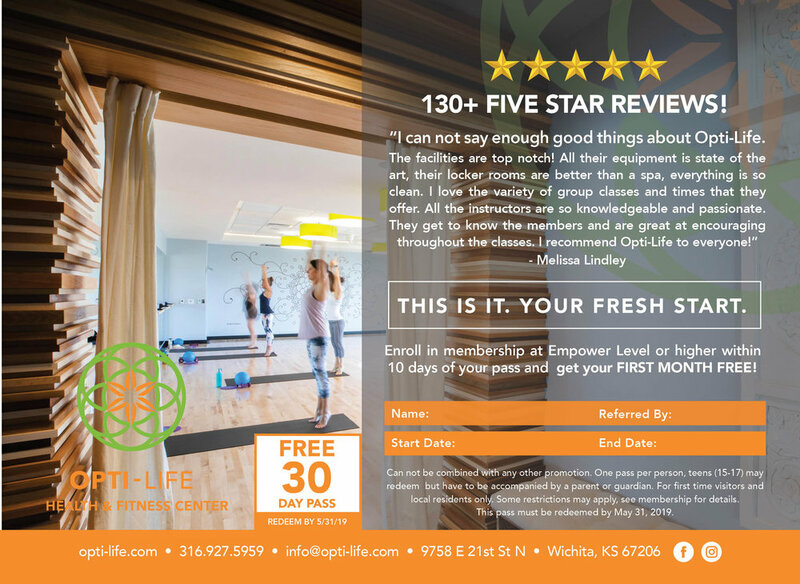 Enroll in membership at Empower Level or higher within 10 days of your trial membership and get YOUR FIRST MONTH FREE. Event only special pricing on our SlimFit Challenges and Fitness Coaching. We provide all the groceries and supplies to make the following 6 family sized meals (4-8 servings). Member price is $100 (gluten free and vegetarian options available). New menus each meek - view http://www.opti-life.com/events for more details. Rejuvenation Spa by Opti-Life is a beautiful 2,000 sq.ft. facility dedicated to helping you stay healthy in both body and mind. Providing facials, massages and a variety of body treatments that will reduce stress and rejuvenate you from the inside out. TUESDAY TALKS - located at the top of the stairs by the cardio floor. Come and go talks with personalized tips to fit each individual and a great way to get to know our spa staff! Enjoy Mimosas and fresh fruit, 5 minute chair massages, skin scans and product recommendations, free use of auto-spa, and event only special pricing! Can not be combined with any other promotion. One pass per person, teens (15-17) may redeem but have to be accompanied by a parent or guardian. For first time visitors and local residents only. Some restrictions may apply, see membership for details. This pass and offer expire on May 31, 2019.